With the European Union (EU) support, the EU PRO developement programme has launched its annual art competition for high school students from 99 local self-governments on the theme “What could Serbia bring to the EU?“ in order to inspire the youth to consider and in a creative manner present what Serbia will contribute to the EU in social, cultural and economic terms. By organising the competition, EU PRO has built on the twelve-year long tradition established by its predecessor Programmes – PRO, EU PROGRES and European PROGRES with a view to encouraging artstic creativity among the young people in the South and South West Serbia. 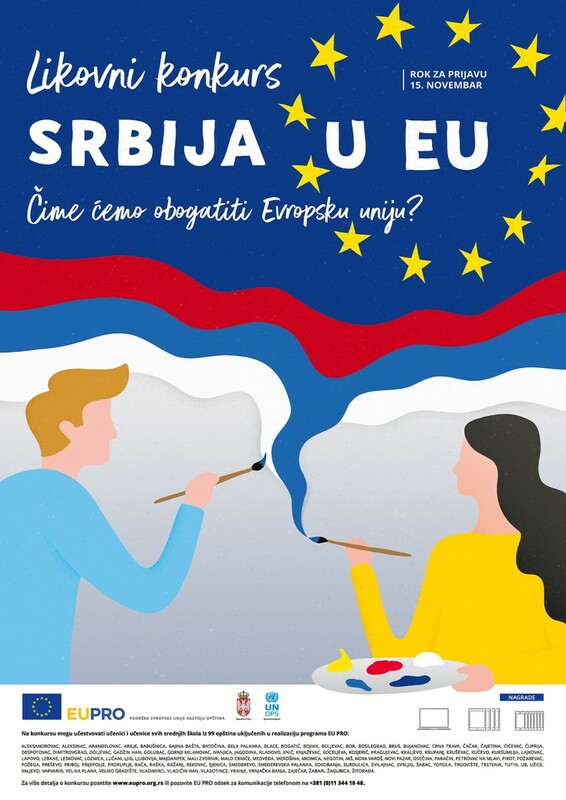 This year theme should motivate high school students to understand the active role Serbia has in the Euroepan integration process and to define and present the qualities that Serbia will add to the EU, taking into account our rich history, tradition and cultural heritage, but also Serbian modern society that lives and promotes many of the key European values. The best art works, to be selected by a jury, will be published on the pages of the 2019 EU PRO Calendar, while their authors will be awarded laptops and tablets, as well as mobile phones. Through the competion, the Programme also invites schools to organise internal contets and the one that invests most effots in the organsiation will be awarded a laptop, and a projector. The contest is open by 15 November 2018, while the award ceremony and the promotion of the Calendar will be held in December 2018. The detailed information about the Art Competition is available at the following link of the EU PRO website: 2019 Calendar Competition Propositions.